Our troop held its first-ever summer court of honor this week. I realize that most troops meet year-around, and hold four courts of honor to recognize their Scouts for their accomplishments. Our troop, however, has long had a policy of not meeting when school is not in session. 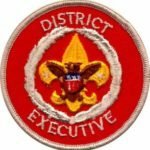 I suggested last year that the Scouts should consider meeting in some way over the summer, the Scoutmaster agreed, and the PLC planned every-other-week troop meetings (in order to dodge around high adventure and summer camp). They did a great job, planning a beach night, a canoeing night, a cooking night and a couple other fun things. Back to the court of honor, though. As you recall, I retired as committee chair earlier this year in order to explore new adventures in Scouting and to allow another Scouter to experience the joys (yes) of leading a talented group of adults committed to Scouting. After the patrols were called up to receive their merit badges and rank advancements from summer camp, Bill Robbins, the new committee chair, asked me to come forward. Bill arranged with the current and former Scoutmasters and assistant Scoutmaster to put together a brief tribute to my eleven years in the troop, naming off a number of positions I held and things I’d done, and presented me with a plaque in recognition. It was quite a moment for me to hear that I had had such an impact on so many people, and I responded with gratitude that I had been given the opportunity to have so much fun and experience personal growth while doing such great things. It’s especially gratifying to see the troop carry on in an upward direction. The adult leadership clearly has the determination to support our Scouts and provide opportunities that they couldn’t experience in any other way. Youth leadership is firmly in place, the outdoor program and high adventure are thriving, and our membership is stable to growing. The greatest reward that we receive from our involvement in Scouting is to see our children grow and develop. Sure, they all grow up one way or another, but through Scouting, they have the advantages that only our movement can offer. Congrats on your award and recognition. 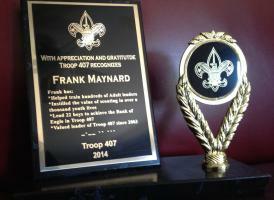 I also have struggled with the “no summer scouting” in our troop and have reversed this trend. It is summer, folks will be on vacation, but some will come, actually I was pleasantly surprised how many did. Not only that with the “active” requirement, and so many adults/troops setting metrics and having unrealistic standards. Summer is one time a Scout who participates in school sports or other activities in school can get caught up on his scout advancement and participate more.